Former world champion Boris Spassky was completely outmaneuvered in his game against Anatoly Karpov in Montreal (1979). See the diagram. Black just played 38 … b5? This is a mistake after white can finish the game with a bang. What is the winning move in this position? After you clicked on the link you will find the complete game. It is a fine positional achievement and a model game on the subject ‘how to play against the isolated queen pawn’. Spassky was nick named ‘the comeback kid’. But here there was no coming back. 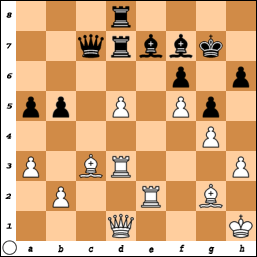 Spassky was rendered completely helpless against white’s clever play. 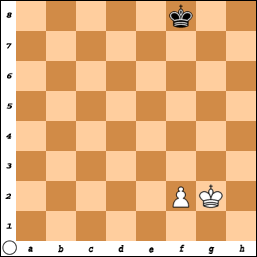 In the middle game the king is usually a weak piece that we try to hide in a save place. But when most of the pieces came of the board, suddenly the monarch springs to life. The king can be a very dangerous attacker. The golden endgame rule is ‘king first’. See the first diagram (I). This is of course a very simple endgame, we should all know how to win. A terrible mistake would be to move the pawn first. 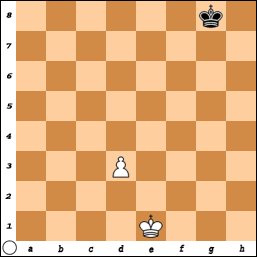 In that case the black king simply stands in front of the pawn and white can’t make any progress. The correct way of course is to first move the king up the board and to get hold of the important squares in front of the pawn. So we need not bother about strategy? Or trying to evaluate postions in the correct way? Boris Gelfand was the clear winner of the Tal Memorial. 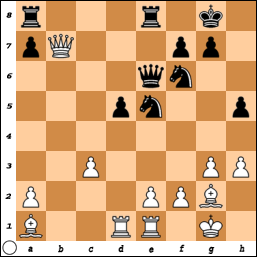 In his game against Nakamura you will find another neat example of the dominance of bishops over knights. See Daniel King’s video. A bishop has its limitations. The poor piece covers only one color. Therefore the possession of the bishop pair can be an advantage. Especially in open positions the bishop pair is a nice plus. In more closed positions the bishop’s actions are hindered by the pawns. So therefore the player who has the bishop pair should strive for opening up the position.